through Vision Quests, Sweat Lodges and Earthdance. and reclaim our Wild Hearts. The Owl/Eagle sweat lodge near Columbus, Texas (west of Houston) will gather on Saturday, May 11, 2019. The Flying Buffalo sweat lodge in Wimberley, Texas will gather Saturday, May 18, 2019. Earthtribe sweat lodges offer a variety of ways to participate: fire tending, drumming circle and teachings around the fire, hot Sweat Lodge, Spirit Lodge (not physically hot), and an intimate community gathering and potluck lunch. If you are coming to Wimberley for the first time, you will go into the Spirit Lodge. We are blessed with many people at the Wimberley lodge, so REGISTRATION IS REQUIRED. PLEASE REGISTER EARLIER THAN 5 DAYS BEFORE THE LODGE. REGISTRATION CLOSES THE THURSDAY BEFORE THE LODGE. Do not wait until the last minute to register! If you are coming for the first time, read the Sweat Lodge page, and then contact Shiila Safer (shiila@creativityinnature.com) to inquire about the Wimberley Lodge. Contact Jyl Scott-Reagan (jylsr@earthlink.net) about the Columbus lodge. For more information about either upcoming sweat lodge, please send email to info@Earthtribe.com. Before attending any Earthtribe event, please review the Waiver and Release agreement that you will be required to sign at the event. Viewing time is 2 1/2 minutes. Enjoy! The Earthtribe Vision Quest last month was both unique and profound and we were gifted with beautiful and powerful visions. The Earthtribe consists of communities that practice Nature-based spirituality. We gather, usually on a monthly basis, to expand our awareness and compassion through our deeper connection with the fields of Nature. We laugh, sing, drum, chant, and bask in the support of a loving community, including humans and all aspects of the Sacred Web of Life. The lions share of our emotional and physical problems stem from our estrangement from nature’s circle of life. The most natural movement on the planet is to push out of the box of our usual identity to the deeper place that is our essence, our spiritual DNA. This deeper place calls us to the Great Return of being part of the flow of our planet’s life. We utilize three major ceremonies – sweat lodges, Vision Quests, and an annual Earthdance – to assist us in this journey to our true identities. We also have integrated into our meditational practices the wisdom of the eight world religions, the guidance of contemporary psychology, and the maps of evolutionary science. In short, we are about an integral practice that expands our awareness of our connection with all creation with the aim of deepening intimacy and compassion. We are a spiritual community of The Center for Creative Resources, Inc. (CCR). Click here for a deeper exploration of the Earthtribe’s parent, CCR. Earth is in the midst of a shuddering, a crisis. Since all of us are a part of Earth, we are part of that upheaval. We feel it personally and collectively. 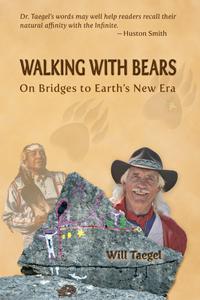 In this groundbreaking book, Walking With Bears: On Bridges to Earth’s New Era, Will Taegel, Ph.D., takes us to the confluence of modern science and ancient wisdom as resources for walking across the bridge from where we are to where we are going. In this exciting page-turner, he takes us to the bridge and walks us across, individually and as a community, through a shamanic story-telling filled with information.